Ezrin, radixin, moesin (ERM) are important membrane-cytoskeletal crosslinkers and are suggested to play important role in cancer progression and metastasis. Even though ERM proteins were generally considered to be functionally redundant and the most studied was ezrin, recent studies highlight their distinct roles in metastatic process. Little information is available regarding the role of individual ERM proteins and their phosphorylated forms in human breast cancer. Our study is the first to examine expression of ezrin, moesin and their phosphorylated forms in primary breast tumors and matched lymph node metastases (LNMs) and their correlation with clinicopathological variables. A total of 88 primary breast cancer, 91 LNMs, 54 intraductal carcinoma and 26 normal adjacent breast tissue samples from tissue microarrays were studied. Expression was determined by immunohistochemistry, the intensity and number of positive cells was scored. Statistical analysis of protein expression and patients’ age, tumor grade and hormonal status was performed. 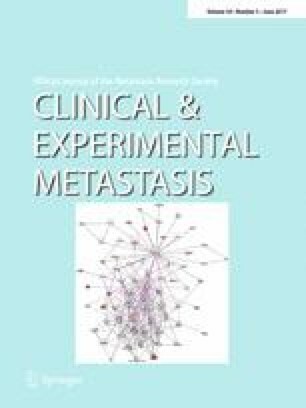 No statistical significant difference was found in ezrin, moesin, p-ezrinTyr353 and pan-p-ezrinThr567/radixinThr564/moesinThr558 expression between primary tumors and LNMs. Even though it was not significant, moesin expression varied between primary tumors, intraductal carcinoma, normal breast adjacent tissue and LNMs. A significant positive correlation between moesin and tumor grade has been proven. Even though primary tumors and matched LNMs did not show different expression patterns, moesin correlated significantly with higher tumor grade. Its positivity in intraductal carcinoma and normal breast tissue adjacent to cancer might indicate its role in tumor intiation/progression. The online version of this article (doi: 10.1007/s10585-017-9853-y) contains supplementary material, which is available to authorized users. The authors thank C. Höchsmann and A. Flemming for their excellent technical support in histology and immunohistochemistry as well as S. Weingartshofer and D. Muhr for material support.